If you have a masonry chimney, the chimney cap and chimney crown protect the top of the flue against animals, debris and moisture. If you have a prefabricated chimney, this is done by the chase cover. A chimney chase cover is a piece of metal that is used to protect the top of a prefabricated or factory-built chimney. Chase covers are designed in a way that lets water safely flow off them, onto the roof and into the gutters. This protects the flue – as well as the rest of the chimney – from water damage. There are three main metals that chase covers are made of: galvanized steel, stainless steel and copper. Galvanized steel is typically the cheapest option and comes standard on most prefabricated chimneys. However, galvanized steel is quick to rust and will often need to be replaced more frequently than chase covers made of other materials. Stainless steel is the strongest of all chase cover building materials, but also comes with a higher price tag. Virtually indestructible, a stainless steel chase cover will last for years to come. Copper is the highest quality – and most expensive – choice for a chimney chase cover. A copper chase cover adds beauty and elegance to your roofline and will only be made more beautiful by the elements as the years pass. When prefabricated chimneys are being installed, many builders opt for cheaper galvanized steel chase covers. While these do their job, they may fail after just a few years; unfortunately, many homeowners do not know how to tell if their chase cover is damaged. The most notable sign of a failing chase cover is rust streaks. Rust streaks are caused by the galvanized metal breaking down and corroding. Even if your chimney is not yet leaking, rust streaks indicate that there are holes in your chase cover and it needs to be replaced as soon as possible. Install A Quality Chase Cover Today! 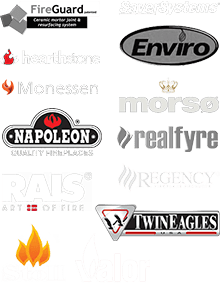 If your prefabricated chimney needs a new chase cover, call Olde Towne Chimney at 812-284-0123! Our expert staff can help you find the chase cover that is right for your home and install it properly! To schedule online, please click here. Having a damaged, missing or deteriorating chimney liner is a wake-up call for chimney repair.  Don’t leave it to chance — leave it to Olde Towne Chimney!